We’re starting on home turf with the glorious Sea-to-Sky Highway. This journey is one you’ll never forget as you make your way from Vancouver to Whistler. In any season, Route 99 is full of spectacular view points where civilization meets raw mother Earth. You’ll witness dreamy waterfalls and menacing canyons, imposing mountain ranges and soaring cliffs. There are many opportunities to stop and take it all in. Whether you want a quick selfie at the Tantalus Lookout, or fancy a short hike up The Chief to experience Howe Sound from above. Take the time to take it all in. Check out these 5 places you have to see between Vancouver and Whistler. You won’t want to miss a single one. Stops along the way: Shannon Falls Provincial Park, The Stawamus Chief, Brandywine Falls, Tantalus Lookout, Whistler Trainwreck. The Canadian Rockies are an iconic North American favourite. Straddling the provincial border between Alberta and British Columbia, the Continental Divide is sure to enchant you. You’ll witness expansive glaciers and rugged mountain wilderness on this trip of a lifetime. 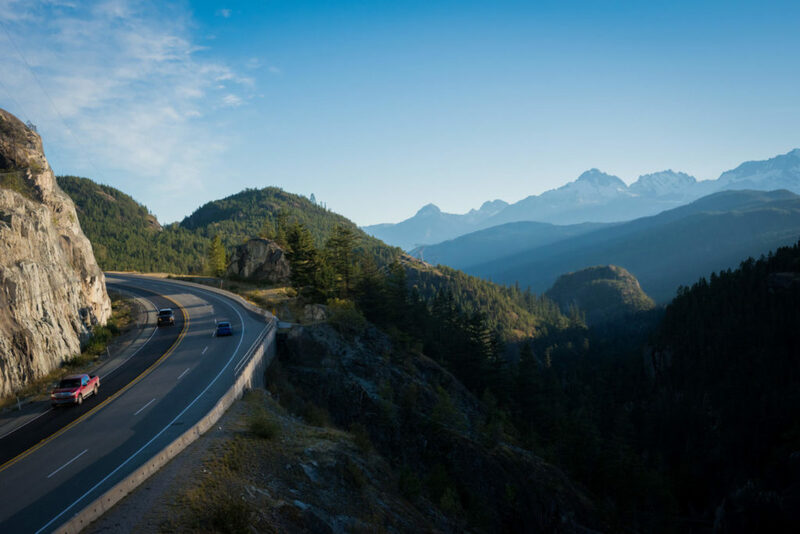 From Vancouver, we recommend the Sea-to-Sky Highway north before joining the Trans Canada Highway to Kamloops. From here, take Route 5 north to take in Wells Grey Provincial Park and Mount Robson Provincial Park. You’ll spot British Columbia’s second-highest peak as you approach the Continental Divide and the glorious Canadian Rockies. From here you have access to Jasper, Lake Louise and Banff. Be sure to add it to your bucketlist! The idyllic summer British Columbia destination has to be Tofino. Known as the surf capital of Canada, Tofino is accessible within a day from Vancouver. Leave the big city behind and embark by ferry to Vancouver Island. The views at this point alone are worth the journey as skyscrapers melt into the horizon and the salty air fills your lungs. Upon arrival at The Island you can fill your day exploring old-growth forest and discovering beautiful, sandy beaches. Wind your way through friendly island communities and discover The Pacific Rim National Park Reserve. There’s countless hiking opportunities as well as plenty of chance to dip your toes in the ocean. This little slice of the Pacific North West is not to be missed! PSA: Canada makes great wine. And it’s imperative that you get on board. The Okanagan Valley is officially Canadian wine country and home to more than 200 wineries. From boutique producers to world-famous brands, the area is a wine-lovers dream. Pair that with top notch dining and you get the picture. From Vancouver, the Okanagan area is a 4-5 hour drive. We’d recommend planning a stay over several days in order to experience the area to its fullest. Be sure to take in Osoyoos, Penticton, Summerland, Peachland and Kelowna as your mainstays. The Okanagan Corridor is packed with unique experiences. Expect vineyards full of character, sandy beaches, and sunsets over the lake – we’re sure you’ll fall in love. Stops along the way: Osoyoos Lake, Kickininee Provincial Park, The Naramata Bench, Peachland. If you’re looking for an EPIC road trip, look no further than the Great Northern Circle Route! This colossal drive will take you through gold rush country and onwards into the rugged Yukon. The legendary Alaska Highway is home to plenty of Canadian wildlife including moose and bears as well as the much sought after Aurora Borealis. Not only will you discover British Columbia’s full geographical spectrum from hot springs to glaciers (and everything in between), you’ll also encounter First Nations culture and provincial heritage, too. Plan your trip over a minimum of two weeks to take it all in and be sure to pack extra SD cards for all the amazing photos that you’re bound to take! Stops along the way: Bear Lake, Fort Nelson, Muncho Lake, Smithers, Telegraph Creek.